Aaron Hernandez told an inmate shortly before his suicide that “if an inmate has an open appeal on his case and dies in prison, he is acquitted of his charge and will be deemed not guilty,” according to a document from the Massachusetts Department of Corrections that was filed in Bristol Superior Court by prospectors. The claim is notable because Hernandez’s family is moving to have his 2015 murder conviction overturned due to a long-standing state law that states a conviction can (and usually will) be vacated if the defendant has not seen out an appeal. In Massachusetts, a first-degree murder conviction goes to an automatic appeal. The Bristol County DA’s office filed a motion in opposition to abatement on Monday May 1; an order from judge E. Susan Garsh said there will be a hearing on the matter on Tuesday May 9. The filing of the DOC document appears to the the DA office’s attempt to bolster the chances of Hernandez’s murder conviction not being vacated. The DA’s office based its motion against abatement on arguments that other jurisdictions are moving away from the practice; that his suicide indicated forfeiture of appeal; and that there would have been a slim chance of him winning his appeal anyway. It’s a tough argument to make, but the pieces of the DOC document that the DA’s office chose to include—you can read them here in full—could help the case for not vacating his sentence on the grounds of him abandoning his right to an appeal. An abatement, while at root a technical legal matter, would have serious consequences, emotional and otherwise, for a variety of people, chief among them the family of Odin Lloyd and Hernandez’s own family. The matter of Hernandez’s money—if he has any of it left, and if he does, how?—has been one that has puzzled reporters since his 2015 conviction. Last year, his defense attorney Jose Baez said he was not doing pro bono work in representing Hernandez in his 2012 double-homicide trial, in which he was acquitted. That just made the mystery all the more intriguing: Surely Hernandez had run through the money he had by paying the attorneys for his first trial? Hernandez’s assets, namely his house, were frozen in December 2013 as part of a civil lawsuit brought by the family of Odin Lloyd, and had another freeze applied in 2014 due to a suit on behalf of the families of Safiro Furtado and Daniel Abreu, of whose murders Hernandez was acquitted a few days before his suicide. Those lawsuits were pending until the completion of his double-homicide trial. What’s on the line is not an insignificant amount of money—which makes Hernandez’s note to his fiancée (“YOU’RE RICH”) even more noteworthy. 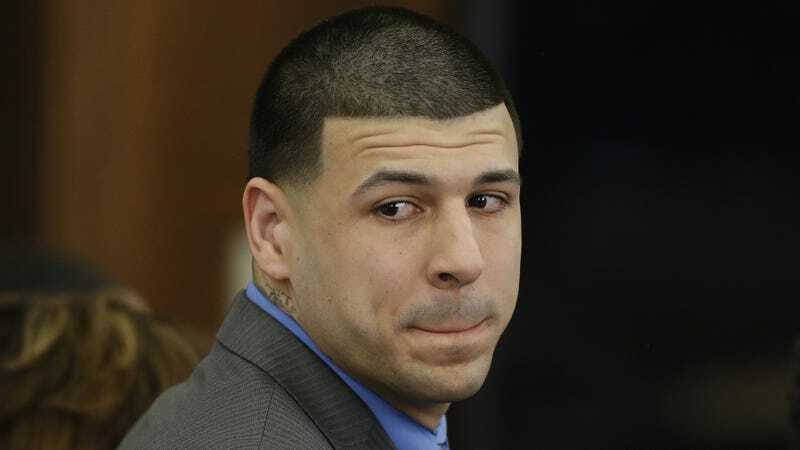 Hernandez’s estate is currently worthless, according to an affidavit filed in probate court. His fiancée and daughter, Shayanna Jenkins-Hernandez and Avielle Hernandez, moved out of the house in North Attleboro, Mass. after Hernandez’s 2015, and are now living in Providence, Rhode Island. There is currently an offer down on the house, which is on the market for $1.3 million. There are also at least two pending matters regarding Hernandez’s compensation from his time in the NFL. The NFLPA, NFL, and Patriots had agreed to table the resolution of any grievances until Hernandez’s legal issues played out. Now that he’s dead, the three parties are going to have to settle those. A grievance by the NFLPA over a $82,000 workout bonus the union claims Hernandez was to be paid by the Patriots but was not. The remaining $3.5 million of the signing bonus Hernandez was contracted to receive after his $32.9 million contract in 2012. Hernandez deferred the payment, but was arrested in the meantime. As a stop-gap in this issue, the NFL and NFLPA granted the Patriots a $1.184 million cap credit, but Hernandez (and now his estate) was still to be paid out in full. Hernandez played three full seasons in the NFL, so his full player benefits package vested. Included in those is his pension, which is typically somewhere around $50,000 per year. Hernandez likely named his fiancée and/or his daughter as his beneficiaries. Tuesday’s hearing on the abatement case will be interesting.